The Fancy socks for The Husband are finished! I’m much happier with the new toes (the ones where I actually followed the pattern since I had to rip back because I’d run out of yarn). Before (on my feet) – seriously, do you see these toes?!? maybe the way to the Dark Side is more like a slide than a road. Those socks are great. I love them. He likes them, so I’m a happy camper. The toes worked out splendidly! I’m sure your husband is going to put these to great use. Michelle recently posted..February Giveaway: Let’s Play Caption! 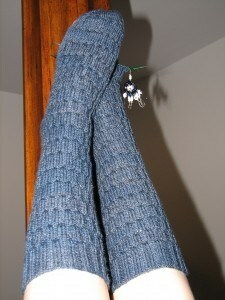 Yes, and now, I have coordinating gray yarn to darn with. Congrats on the socks, they look awesome. Nice looking socks. 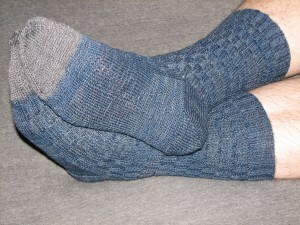 I do think once you walk around with hand-knit socks on your feet, you are spoiled forever. That’s very sweet of you to say. Thanks! LOVE these socks! Both the before and after. I love how they changed up toe looks. Soon he’ll be converted to the must always wear handknit sock club. I’ll have to keep ya’ll posted on the status of his conversion. I was pleased when he wore the first plain black pair to work. Those socks are great, I love the gray toes. Lea67000 recently posted..Giveaway: want some yarn?